The video I shot during my ride in the Electirc DeLorean has been seen a few times by people around the world. DMC somehow found it and posted a link on their Facebook page. I never really did any promotion for it, except for showing some people at work. Now, Autoblog found it and has used it in their article. The electric DeLorean DMC-12 is coming 2013, so says Humble, Texas' reborn DeLorean Motor Company. That was the shocking announcement made by DeLorean in mid-October at the DMC Texas Open House. But what else occurred on that mid-October day? Well, apparently a handful of DeLorean enthusiasts got to test drive DMC's electric prototype. Now, we can't say for certain whether this clip shows DMC's own electric version of the DMC-12 or the work of some shadetree mechanic, but we can say with confidence that DMC's Cameron Wynne (son of Stephen Wynne, owner of DeLorean) is the one who is driving the electric vehicle around the track. Dubbed the DMCEV-12, DeLorean claims this electric time machine hits 60 miles per hour in a quick 4.9 seconds and warps to a top speed of 125 mph, though we'll have to wait to hear more about total range. Reports suggest the limited production DMCEV-12 will retail for approximately $100,000. Oh wait, there is more. My video is also featured on engadget. Last week we brought you news of DeLorean Motor Company (DMC) working on an electric car. We now have a video showing the new in new Electric DeLorean prototype hitting up the track at Houston Motorsports Park. In 2013, you will be able to purchase the Electric DeLorean for somewhere around $90-$100 grand. Funny thing is, we’ve always imagine the Back to the Future DeLorean always being a fully electric car. Next thing on DeLorean’s list? Making the car fly and time travel. Finally, a video showing what it's like to drive the upcoming 2013 all-electric DeLorean has been released. It features "a mysterious box labeled 'Flux' on it and aside from the iPhone dock, 125 mile per hour speed and 260 horsepower, built-in GPS navigation system, DMC is remaining mum on the vehicle's specs." Video after the break. Some of readers will remember the new electric DeLorean that was announced recently, the car which was originally made famous by the Back To the Future movies will go on sale in 2013 powered by an electric engine. Now we get to see our first video of the DeLorean EV in action, although the video is shot from the inside of the car, so we don’t get a good look at the outside, but we all know what that looks like. The DeLorean EV is expected to reach speeds of up to 125MPH and will reportedly come with over 200 Bhp when it goes into production in 2013. I figured if they use my video, I can use their words. Here is my video, in case you do not want to read through that long post below. Although, this is getting long as I am find more blogs out there using my video. This post will have lots of pictures. Easy for you to read...more important, easy for me to write. 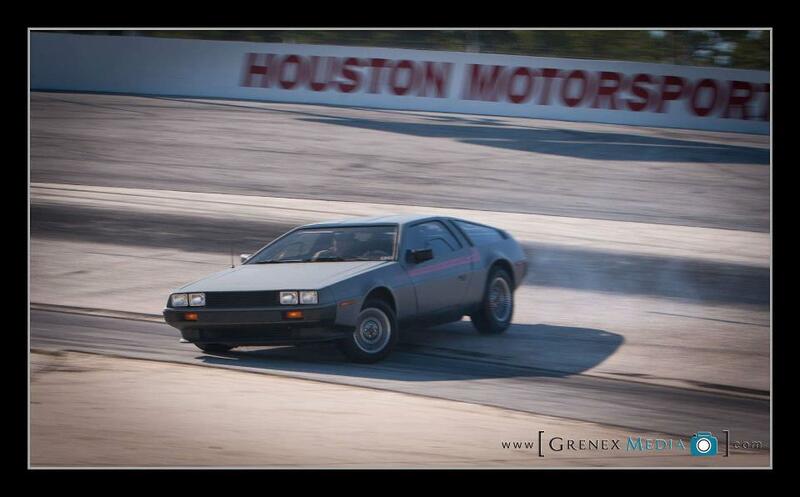 From 14-16 October 2011, DeLorean Motor Company held an Open House at their facilities in Humble, Texas. I was invited earlier in the year by DMC Vice President James Espey to attend. It was decision that I would not regret. Houston in the middle of October is still crazy hot, temperatures were in the 90's. First thing we did when we got into Houston was to check into the hotel. Waiting for us there were some folks from DMC with our registration packets and goodie bags. We also had to sign a release form for video and photography. We checked out the hotel before the events started. When it was time, we all took the shuttle to DeLorean Motor Company. I did not take that many pictures, but the I always take a photo of me jumping in the air. Pretty much every vacation spot in the past decade or so, I have taking the jumpman photo. 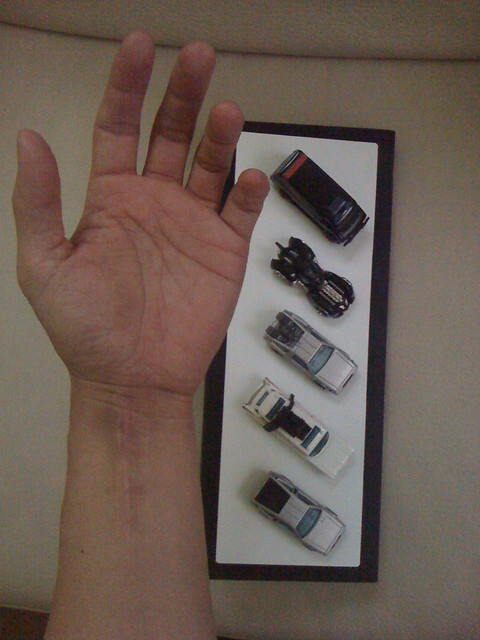 Since my awesome wrist injury, I have added the scar photo as my mush have photo opportunity shots. The event was a great occasion for me to meet new friends and catch up with old ones. I met Cameron last year at the DMC-California Open House. I failed to get a photo last time, but quickly hunted him down for this great photo in front of DMC. One of the many people finally got to meet was Stephen Wynne, Cameron's dad and President/CEO of DMC. Ha, we almost have the same hair style. There were many surprises that DMC had for us. The first thing that everyone saw was the new underbody made from the original molds. I was told that this got there that week, they did not have time to drill the holes and add the hardware. So, it was fresh...mmm, smells good. Construction is some sort of fibreglass honeycomb structure with injected resin. The new underbody is almost half the weight at 250 pounds, versus the 30 year old original tubs at about 450 pounds. Estimated cost is around $5000. Unveiling of the DMCev (Electric DeLorean), I was there! The big surprise was the unveiling of the Electric DeLorean, DMCev. Like other all electric cars, the prototype wooshed through the parking lot in stealth mode, absolute silence. All you heard was wheels rolling and the crowd in awe. There are lots of batteries in this thing, some in the engine compartment, some in the luggage compartment. The car itself weight about 200 pounds more than a standard DeLorean. I guess when they come around to actually building these, they will use the new, lighter undebodies. According to the spec sheet, it will have a range of about 100 miles, standard for most electric cars. Top speed of 125 mph and 0-60 in 4.9 seconds. Compare that to the 10.5 seconds in the standard gas guzzling cousin. Other than the whole battery and electric engine, one of the things that stand out is the cockpit. I just like saying cockpit. They went with a custom steering wheel by Momo, giving it a modern look. Actually, if I ever need a steering wheel replacement, I might go for one of these. Gone is the standard shifter and replaced by a metal hockey puck. A dial that lets you select R-N-D, just turn the key and click it to D and you are ready to go. There is also an economy mode, that is activated by pressing the button below the dial. Below that, you can see three seashells buttons that release the doors. Left, both, or right doors can be opened with a press of a button. I guess you can go old school and use the door pull. If you look in the ash tray, you can see a series of lights. That is the charge indicator. There are plans to make the existing fuel gauge a battery life indicator. Of course, there is an iPod dock for all your awesome tunes. Catering for the night's event was provided by a food truck. I forgot the name of it, but it was damn good stuff. I had their shrimp burrito and went back for a shrimp taco. Little long on the wait because of the large crowd they had to serve, but it was well worth every bite. This day was packed full of events. While the guys were geeking out during the tech sessions, some of the ladies went to the spa for a massage, manicure, and pedicure. They even went on an unplanned trip to downtown Houston for an afternoon of shopping. I got to meet all the dealers from the six DMC locations. I even met Tamir Ardon of entermyworld.com, probably the best DeLorean site out there. It is loaded with information and where I acquired much of my information on the DeLorean. Part of my research in making the Hot Wheel DeLorean was spent on Tamir's site. First stop in the tech sessions was with Ed Uding of DMC-Europe. He showed his new roof structure, developed to replace rusted out roof supports that cause the roof to sad and doors to be misaligned. This is the part where the door would attach to the underbody, under the T-panel. Dave Swingle of DMC-Midwest and Toby Peterson of DMC-Northwest, showed how to install door seals. Seals will crack due to old age and exposure to UV, the correct technique and placement will help ensure a proper seal of the doors. Don Steger and Danny Botkin of DMC-California gave a demo of how to rebuild front brake calipers with the available repair kit. Kinda neat to see a gutted set of calipers. We were also educated on rotor safety specs and recommended upgrades to stainless steel brake lines. I might do that upgrade some time in the near future. The guest speaker was William Haddad, former executive at the original DeLorean Motor Company. He also wrote the book Hard Driving: My Years with John DeLorean. He had some interesting stories about John and the company, as well as John's time at General Motors. For me, the most interesting part of the tech sessions was finishing the stainless steel. All the other sessions did not seem to be as doable for do-it-yourselfers. This one seemed doable for me. Tony Ierardi of DMC-Florida showed us how to remove dents and regrain the stainless steel panels. Basically, a lot of filing and sanding. I might try this one day. You can see DMC employee Bill in the background using a file to even out the surface on a beat up left front fender . Tony is using an original tool they used in Dunmurry over thirty years ago. Also used were 60 grit sandpaper and blending pads. It took about 30-40 minutes, at the end, Tony was able to remove a dent about the size of a dime and put a beautiful finish on the area he was working on. The world famous warehouse tour was guided by James Espey. This was so awesome, I did it twice. Walking up and down the isles of the warehouse, you could not only thousand of parts, but also some of the original shipping containers those parts came in. Although they do not have all the parts, as some have just ran out, but when they have parts, they have lots of parts...like doors. There are lots of doors. They even had original bins that were made for the original DeLorean Factory in North Ireland. I took various photos of the many parts with my Hot Wheels car in frame as I walked up and down the aisles. This concluded the daytime activities of the Open House. We all went back to the hotel and got ready for dinner at H&H Ranch. Again, we had a shuttle provided by DMC, via the hotel, to and from the ranch. In true Texas fashion, there was a mechanical bull set up for everyone to ride. Most of the DMC crew jumped on and got thrown off. I elected not to fly off the bull. Although, I kinda wanted to see if I can still do some pommel horse tricks. Dinner was a Texas barbeque, one of the staff was nice enough to make me a custom veggie burger. After the dinner was some presentations and the raffle. Proceeds from the raffle went to a fellow DeLorean owner who suffered an injury and lost his wife while performing stunts at an air show. When I heard about the charity raffle, I hunted down some Hot Wheels stuff for the event. I was able to get a 2011 Hot Wheels poster signed by the entire design team, 2011 San Diego Comic Con Back to the Future Time Machine Exclusive signed by the designer...which happens to be me, and a pre-production sample of the Back to the Future Time Machine also signed by me. James introduced me as the Hot Wheels Designer for the DeLorean, and had me talk about the items I brought for the raffle. I am not a good speaker, but I appreciated the opportunity to promote Hot Wheels to a different crowd. Kinda funny that at work and the Hot Wheels community, I am the DeLorean "expert"...while in the DeLorean community, I am the Hot Wheels "expert". Little do they know that I know nothing about either. I tried to get a picture with all the winners, but I failed to get one with the SDCC BTTF Time Machine. They were all very excited to win those items. The winner of the poster wanted a picture with me. A few people came up to me to thank me for what I have done for the DeLorean community and were very happy with my Hot Wheel DeLorean. Good to know that my work is appreciated, and if these guys liked it, I know it passed the test. The winner of the pre-production sample was Josh Haldeman. I kinda knew him through Facebook when he somehow found me about a year ago. He had no idea who I was, just knew I was a DeLorean enthusiast. Josh is also the Vice President of the DeLorean Owners Association, so I am glad that the item went to him. I had to get a photo with Tamir. He is somewhat of a celebrity in the DeLorean universe. I have gone through his website many times in the last ten years, and continue to drop by his forum at DMCTalk.org, the largest online community of DeLorean enthusiasts. That concluded a long day of events at the DMC Open House. Time to shuttle back to the hotel and get some sleep. We did not have plans to go to track day. For one we did not have a car to drive on the track. Two, our flight left at 3:40PM and figured we would check out of the hotel at the standard noon check out time. Cameron was nice enough to invite us to the track. He had the van was going to pick up the dealers anyway and saved two spots for us to tag along. Talk about going the extra mile for us. This really capped off the series of events. So, off to the track we go. There was about eighteen DeLoreans there, pretty impressive to see them all on the track at once. They took a few laps for some photos and lined up to take the open door 'tunnel' shot. In addition to the owners and their cars, DMC brought the Electric DeLorean and the Supercharged Stage III DeLorean to the track. Funny to see the Electric DeLorean take laps. I say "see" because, you really could no hear it as it zoomed passed you. You could tell it had a little more kick than your standard DeLorean...or I just drive slow. Timing is everything since it was a short track. Did not have to wait long for these photo opportunities, but had to be quick on the trigger. It was a hot summer fall day in mid-October that day in Texas. There was no way I could have driven my car to the event. One guy from the Los Angels area did, but he is retired and probably has as much money as he does time. Also, I do not think my car could make that journey as it may require many many trips to the gas station. Much more economical for us to fly. Since I could not bring my real car, I brought my Hot Wheels DeLorean along for the event. Cameron gave me and Patchan a ride in the DMCev. It is a really smooth ride, quiet, and had quite a punch. Here is a video I took of my ride with my iPod Touch. It is a little shaky, that is my amateur camera work, not from the car. Here a better look at the controls of the car. From left to right in picture below: You have the all important iPod dock, as all modern cars now have. Shift dial, instead of shift stick. Eco button. Three buttons for the doors. Also has a GPS device and Momo steering wheel. That is pretty much the only difference from a standard DeLorean interior. The DMCev was definitely the star of the event. I guess the co-star of the event was the Supercharged Stage III DeLorean. I asked Ed Uding of DMC-Europe to take me around a laps. It was a ride of a life time. Ed was (or maybe still is ) a race and/or rally driver in Europe, so he knows how to handle a car. He also developed the lower control arm bracket for the DeLorean for better handling and stability. I have a set that is installed in my car. Sitting in the passenger seat with an experienced driver is quite the experience. Ed was going really fast around the turns and even faster on the straightaways. I felt my body being pushed towards the outside of the car from the centrifugal force. It also felt like blood was rushing from my head. Must have pulled at least 2G's...now I kinda know how fighter pilots feel. Ed also drifted the DeLorean for the photographer there. Luckily, I was in the car when he did it. That was more fun than any roller coaster ride I have been on. Above is the picture of Ed drifting and eventually doing a 360 on the track, with me in the passenger seat hanging on for dear life...and having the time of my life. There were a few more runs on the track and photos taken. Stephen even offered to let me dirve the Stage III car, too bad I do not know how to drive a manual. Damn it! Way back in the day, I told myself that if I ever got a DeLorean, I would learn how to drive a manual...but since they may an automatic version, I never really learned. Oh well, I am really happy with my car. That third pedal thing is confusing anyway. Pretty soon it was time for us to go back to the hotel and check out, then head to the airport. Elaine gave us a private ride back to the hotel. I cannot express how nice the Wynne's were to us. Thanks to everyone at DeLorean Motor Company for putting together a great event. It was great to meet all the dealers from DMC-NW, DMC-MW, DMC-FL,DMC-EU. Great seeing the guys from DMC-CA, and finally getting to meet the folks as DMC-H.
Also, thanks to everyone who attended the event. I met some great people and made some new friends, including Tamir and local DeLorean owner Bryan. Thanks, hopefully I can make it to Orlando for DCS 2012. Probably my favourite picture of the event. My wife and I with the Wynne Family.